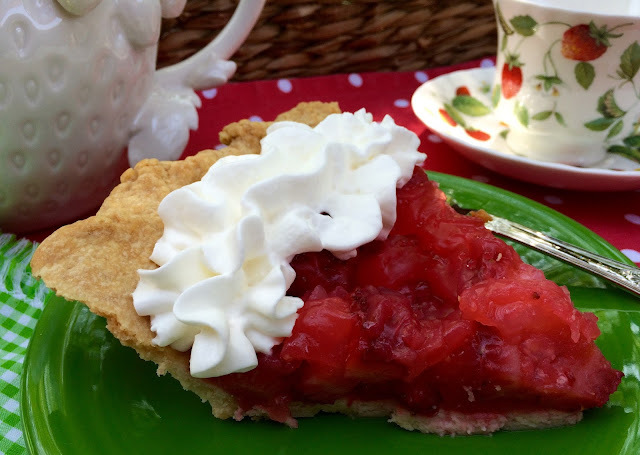 Please join me for one of my favorite pies in the whole wide world...Strawberry! This is one of my favorite teacups, which is Alpine Strawberry, by Roy Kirkham. Isn't it a pretty design with the bees, leaves and blossoms, and strawberries? I've shared this recipe before, but wanted to pass it along again. The source of this recipe was from the Columbus Dispatch, when readers would submit their favorite recipes. I cut the recipe out, probably in the early 1970's, as a new bride. I have made this pie and shared this recipe so many times. I hope you try it! Combine sugar & cornstarch in a heavy saucepan & stir. Add water, corn syrup & salt. Cook until thickened & clear in color. Remove from heat & add gelatin, stirring well to dissolve the gelatin. The original recipe said to add red food coloring, but I never do. Let cool. Pour over the berries. I usually cut the berries in half. Mix gently & pour into the baked pie shell. Chill. Top with whipped cream. Such a pretty pie and a pretty setting. I love the strawberry plate. I'm passing this recipe on to my pie making son. He's never made a strawberry pie and I love strawberries. This will be my next request from him. Thanks for sharing the recipe and showing it in such a lovely way! You should compile these posts for a family cookbook by Kitty and make sure you include all the pictures.Have a wonderful week! Our berries are in too--this pie looks scrumptious. Your pie looks so delicious I wish I had a piece right now - with those tuna yummies on Sandi's blog and tomato basil soup! Time for lunch I guess! Thanks for the recipe!!! Thanks for sharing and linking. I just made a batch (4) of pie shells day before yesterday - used two making pumpkinpie (yes I make and we eat them year-round,) and I have two left. We happen to have a quart of fresh strawberries in the fridge. Hubs is allergic to them so I haven't made one of these in years, but my oh my I do love them! I have blueberries too, maybe I will make little ones of each, covering them up with the extra pie dough. I have some thinking to do. Thanks for sharing your special "heirloom" recipe with us, Kitty! Hugs. Do have a wonderful week! Hello Kitty, wow this strawberry pie looks and sounds so good. I never had this before but I'll have to remember to make this for the summer. Oh, Kitty, your pie looks so good! I adore strawberries and I can't wait for the season to start which is usually last of June and first of July here. Your teacup is absolutely perfect and what a lovely setting with your fountain in the background. I think I can hear the water trickling over the rocks. Thank you for sharing, my sweet friend. Hi Kitty, what a darling teacup. I love that sweet design with the bees. Your strawberry pie looks so good and sounds easy to make. Thanks for sharing the recipe. Love your pretty setting by the waterfall. Such a nice way to enjoy tea. Kitty, such a lovely china pattern on the teacup and saucer. This pie is surly delicious and I will have to make it soon. I love strawberries and this is such a pretty way to enjoy them. Love your strawberry-themed tea from the cute teapot and teacup to the delicious strawberry pie. YUM! I like this teacup all over again every time you bring it out for berry season Kitty. Fruit pies are my favourite...strawberry alone as you've made, or strawberry/rhubarb. Pretty darn cute tea setting when even the teapot is a strawberry! Kitty, we're on the same wave length...I just made 2 strawberry pies the other day. :) Your tea cup and saucer are beautiful, as is the tea pot. How cute strawberry tea cup & saucer ... & your pie looks very yummy !!!! John's in for a treat. He is thinking strawberry shortcake and I'm thinking strawberry pie. Hope that a graham cracker pie crust wouldn't be too wrong. The graham cracker crust was fine and this recipe gets a two-thumbs-up from my place. I may have a piece for breakfast! Strawberry pie...yum!! 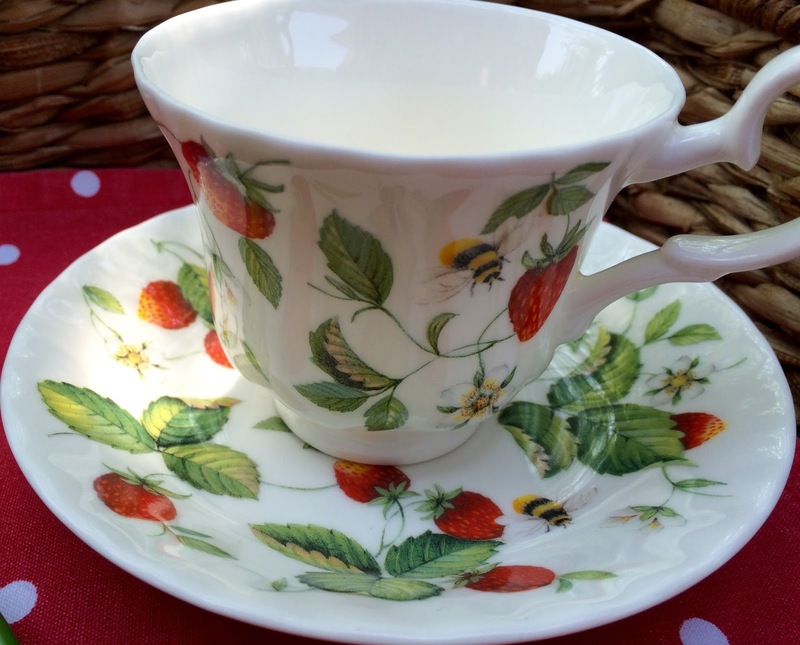 I love the gorgeous strawberry teacup and saucer, 'tis such a pretty and colourful design. Oh Kitty this looks so delicious! This is a summer favorite! That has to be one of the prettiest teacups you own, Kitty! It goes so beautifully with that yummy looking dessert. I meant to make it from your recipe last time you shared it & never did. I will FOR SURE this summer! Thanks for bringing it up again & reminding me/us. Everything looks so beautiful, especially your waterfall! And the pie is so yummy looking. Enjoy the rest of your week! Oh Kitty I love this pie! My mom makes the very same recipe and it is so delicious. We were just talking about making it the other day! Yours looks pretty yummy and I love that you have a matching tea cup! That's the first thing I look for now when you make a dessert--the matching tea cup! LOL! Hope you are enjoying your week! Nothing like fresh strawberry pie! I am actually kindof craving a strawberry rhubarb and was thinking of making one. I use more strawberries than rhubarb and it's pretty darn yummy! :) Love your darling teacup. Perfect for Strawberry Days! Thanks for sharing with SYC. So many of my Texas friends do, and just the sound of that gurgling water cools one off during our hot spell. Such pretty dishes too-thank you for sharing your recipe with today, it looks and sounds so wonderful! Kitty, I love your strawberry cup and saucer. Wedgwood also has a strawberry pattern that has tempted me since I was a teenager. Your pie looks wonderful! Thanks for reminding me that it's strawberry pie time! 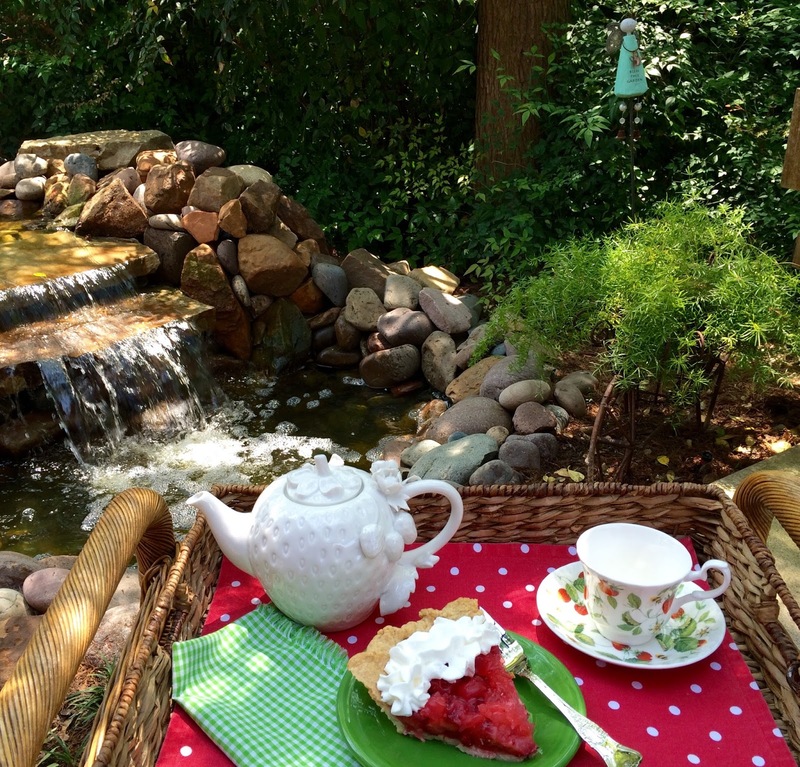 Oh, the cup and saucer are sooo pretty...that pie really looks delicious and that little waterfall is so delightful. Yummy! I have some frozen strawberries from last year that I added sugar to- I wonder if I could work them together into this recipe. Love the sweet strawberry cup and saucer- what a cute set. I pinned your recipe and if the produce stands were open right now, I would be out hunting for strawberries. But, it's after midnight so I will have to wait. Thank you so much for participating in "Tea In The Garden". Many people have commented that they are making your pie too! Me next! OOh Kitty, I love your teacup with all the strawberries on it. Strawberry pie is one of my favorites also. Well strawberry anything is my favorite! Strawberry season is in late June here in NY, so I will be putting this pie on my schedule. I love a fresh strawberry pie! Strawberry pie is one of my absolute favorites! I adore your strawberry china. We so appreciate you joining the Thoughts of Home on Thursday gathering. May you have a delightfully lovely weekend. Have any pie left? I doubt it! This post was featured on my blog today Kitty - congratulations! Who doesn't love strawberry pie Kitty, one of my favorite summer treats! Yours looks divine! I want to make that pie it looks delightful! - Kelly T.